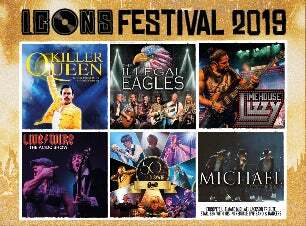 Icons Festival is excited to launch as the greatest tribute rock music festival in the UK and has the ultimate line-up of Europe’s top six tribute bands saluting some the greatest music icons of all time. The line-up consists of The Illegal Eagles, Live/Wire, Ben as Michael Jackson, Killer Queen, Limehouse Lizzy, Absolute Bowie and will offer six stunning stage shows. Plus, the one and only Tony Blackburn will be hosting throughout the day and spinning some discs in-between performances. This is a family event set in a grassland park with easy rail connections presenting camping and caravanning, quality food and drinks - and above all, a celebration of awesome contributions made to music by artists who were truly iconic.